Mega Music have keyboards, large and small, for beginners through to professional. We stock and sell compact budget keyboards to learn on or for fun, digital pianos for a touch of style and real piano sound at home, stage pianos for the serious player and controller keyboards for use with computers and software. With Yamaha, Korg, Roland, AKAI and Casio as just a few brands we partner with, we know we have the keys to a bright playing future, however that looks to you. Check out our online range, or come into a Mega Music store for the finest service in the land. Vintage cool in sound and appearance - discover all the SV-1 has to offer with Mega Music. WITH FREE KS128 DOUBLE BRACED KEYBOARD STAND! The Nord Electro 6D 61 features an Organ section with drawbars, a Piano and Sample Synth section - a complete stage piano like no other. WITH FREE KS128 DOUBLE BRACED KEYBOARD STAND! The Nord Electro 6D 73 features an Organ section with drawbars, a Piano and Sample Synth section - a complete stage piano like no other. WITH FREE KS128 DOUBLE BRACED KEYBOARD STAND! 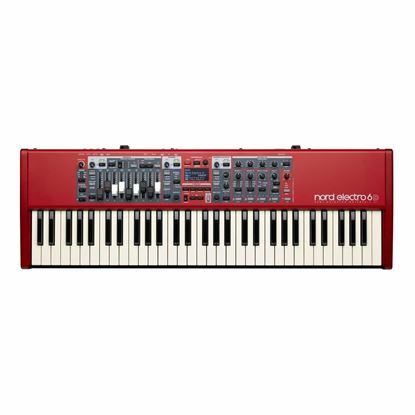 The Nord Electro 6 HP 73 Note Hammer Action features an Organ section, a Piano and Sample Synth section - a complete stage piano like no other. The Celviano Grand Hybrid is a whole new level in premium digital grand piano that feels and sounds amazingly authentic. Suitable sustain pedal that will suit the top brands of keyboard, get a Cherub to sustain your Casio, Yamaha or Roland. This is the full size 88 key model of the new Korg KRONOS. With nine distinct synthesis engines and a complete suite of performance and productions tools, KRONOS is a must-see synthesizer for the musician or producer who needs ultimate versatility. The KRONOS LS brings your all the standout features of the KRONOS workstation in a light touch and more portable format. Take KRONOS anywhere. Serious synthesizer and vocoder functionality in a compact package --- the microKORG at Mega Music. MicroKORG with classic vintage sounds and vocoder.